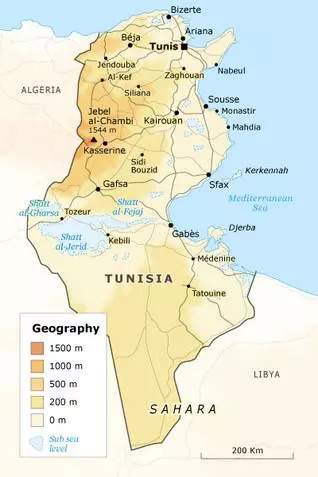 During the Middle Ages the region that forms the present-day state of Tunisia was part of the province of Ifriqiya, corresponding approximately to the Roman province of Africa. It included Tunisia; Tripolitania, in what is now western Libya; and part of eastern present-day Algeria. Ifriqiya’s exact boundaries, however, changed over the centuries, depending on which powers dominated the region; at some times, Ifriqiya even included the island of Sicily. The historical Islamic city of Qayrawan (now spelt Kairouan), founded in about 670, was the main city of Ifriqiya. In the 1520s, Ifriqiya, then under Ottoman rule, lost control of Constantine, in the eastern part of Algeria. It eventually also had to give up Tripolitania. Although part of the Ottoman Empire, Tunisia gradually became an effectively autonomous province, ruled by the beys, until French occupation. The state borders of the French protectorate, established in 1881, are Tunisia’s present boundaries. Tunisia is generally a resource-poor country, but it does have phosphate, and some petroleum, gas, lead, iron ore, zinc, and salt. Tunisia is a leading producer of natural phosphate and mineral fertilizers. In 2007, phosphate production reached 8 million, ranking Tunisia fifth globally. Tunisia is the second-largest producer of phosphate in Africa. Tunisia exports natural phosphate to fifty countries on five continents. Tunisia’s Phosphate Company in Gafsa has been mining for more than a century. It has one underground mine and seven open-cast mines, and it owns five sites, in Mdhilla M’dhilla, Sfax, GabesGabès, Skhira and Meknassi. 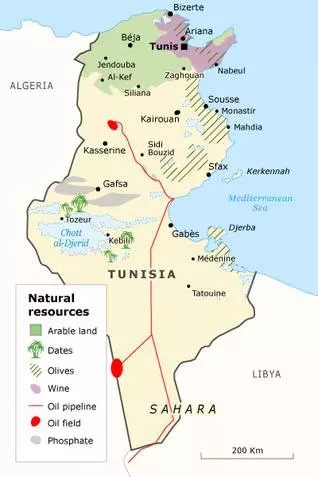 During the first twenty years, Tunisia exported all its phosphate-rock, but it now processes more than 80 percent of its production in the country. Tunisia’s greatest energy demands are for oil and gas, representing approximately 48.30 percent and 39 percent, respectively, of the country’s total energy requirements. Tunisia’s oil industry is still modest compared with those of its neighbouring countries of Algeria and Libya. Tunisia’s most significant oil fields are Sidi al-Kilani, al-Borma, and Ashtart. In 2009, Tunisia produced about 81,000 barrels of crude oil per day. Tunisia’s reserves of crude oil rose to 388 million barrels in 2008 from 300 million barrels in 2000. Domestic demand for crude oil has increased simultaneously, from around 83,000 barrels per day in 1999 to almost 108,000 barrels per day in 2009, resulting in a halt of crude oil exportation, and the import of refined petroleum products to cover increasing domestic demand. Tunisia has nine national parks and fifteen natural reserves that together account for 6 percent of the country’s land area. Situated throughout the country, they reflect Tunisia’s diverse geographical and climate conditions. 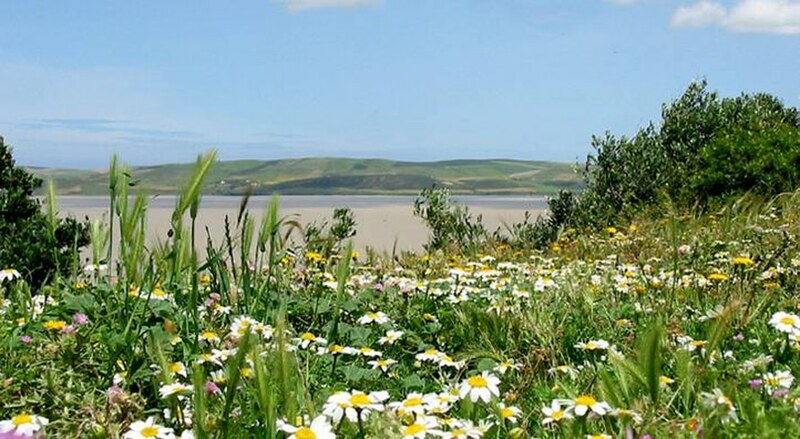 Ichkeul National Park, near the northern city of Bizerte, encompasses Ichkeul Lake and the surrounding wetlands, which are famous for the migrating birds that visit the park each year. It is the only park that has visitor facilities; it has been listed as a UNESCO World Heritage Site since 1980. Sidi Toui National Park, in a mountainous region in Tunisia’s south, is known for its arid plains, salt flats, and seasonally dry rivers that surround the Jebel Sidi Toui. In the Sahara, Jebil National Park is characterized by an impressive flora (including desert shrubs) and fauna. It is Tunisia’s largest national park, comprising about 150,000 hectares. 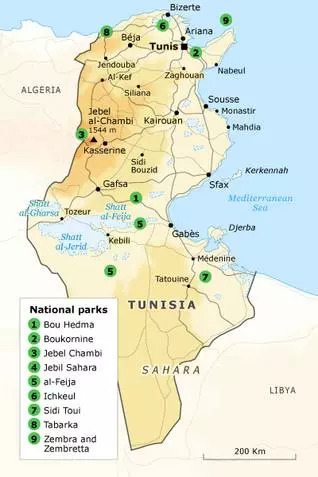 Other national parks include Bou Hedma (east of Gafsa), Boukornine (south of Tunis), Jebel Chambi (west of Kasserine), al-Feija (north-west of Ghardimaou), Jebel Orbata (west of Gafsa), Zaghouan (south of Tunis), and the islands Zembra and Zembretta. Tunisia was ranked 99th in the 2012 Environment Performance Index, indicating that its awareness of environmental protection is still modest. Environmental-awareness campaigns are often funded by international foundations and by organizations that are based in Tunisia, and there are some small-scale local initiatives. Laws regulating waste disposal, including that produced by large firms and industrial sites, are needed to ensure a sustainable environment. For various reasons, including climate change and a general scarcity of renewable-water resources, Tunisia’s exploitable water resources are under special threat in the coming years.